Combine all of the ingredients in a large bowl. Pour half into a large blender and blend smooth. Pour the blended mixture into a jelly roll baking pan and slide into the freezer. Pour the remaining liquid into the blender and, when smooth, transfer it to the jelly roll pan. Freeze for an hour, then scrape semi-frozen liquid with a fork to break up the crystals. Continue to freeze for another 1 1/2 -2 hours, scraping the crystals every 30 minutes or so. 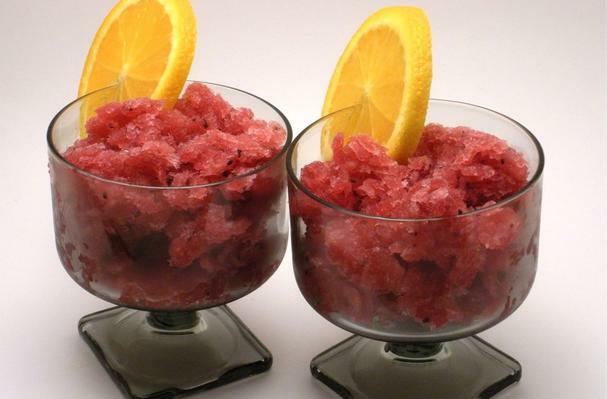 Serve crystallized granitas in the vessel of your choice. If there are leftovers, place in a air-tight container and keep in the freezer. We were late to the disco with this one, but better late than never. We recently discovered the grandeur that is pomegranate juice. Mind you, we’ve had our share of pomtinis and pomagaritas, but there’s more to this sweet, tart liquid than mixing it into a cocktail. Well, we fully support mixing it into a cocktail, so maybe we should further explain. What we mean is that the pomegranate is totally and truly delicious, and so is its juice. We received a lovely box of samples from Molly at Pom Wonderful, and in an overzealous act of experimentation, we took to the kitchen to see what we could do with it. What started as “Let’s make pom glazed salmon” turned into a full course meal with a cold drink to top it off. Sometimes we get so excited about the possibilities that we end up testing them all. That being said, an afternoon of phe-pom-enon was born! Oh, and did we mention we made a lightbox too? Truly pom-tastic. These dishes really knocked our striped socks off. First off, the cocktail. We’ve seen granitas all over the net, and we’ve wanted to give it a try for a while. This was so good, we shared it with no one. We finished off everything ourselves in two days. Talk about the summer slushie! The galette was literally a last minute creation. We made one last month, and we had leftover dough in the freezer. We pulled out the dough and got to work stuffing it with sweet apples and tangy pom juice. It was just enough for two people to share. As for the salmon, well it was supposed to be a very simple dish, but we got a bit out of hand…in the best way. The final dish was literally a mouth explosion of flavors and textures–sweet oranges, tangy pomegranate, tender salmon, buttery avocados, crunchy fennel, zesty cumin seeds! This was undoubtedly one of the best meals we’ve had in a long time, and we feel the need to share it with everyone.